I’ve joined forces with a lovely, talented, and creative group of folks who, for the next 2 months, will be chasing kite tails. What’s that now, you might ask? Think of a dream like a kite. Chasing that dream requires first grabbing a hold of that kite tail, right? Right! Over the course of this past year, I’ve prayed, brainstormed, networked, prayed, researched, and have I mentioned that I’ve prayed the tar right out of some of my dreams. Unfortunately, I’ve received quite a loud “NO!” on one or three. Actually, the door hit me on the way out, where one of them was concerned, but that’s fine by me. I’ve never felt the burn of the refining fire more than I have in this past year. I look at it a little like a doctor’s diagnosis in that you have to weed out the things that it’s not in order to figure out what it is. Do you have dreams that are just beginning to kindle? Is there a little ember in there that needs to be fanned and encouraged to ignite? I believe, with every fiber of my being, that God gives us dreams. Sometimes, he plants them deep within our hearts and no amount of work on our part can bring them about until He determines the time and place. Others, more obvious dreams, seem to stem from some natural talent or gifting that others see in us, encourage in us, or grow in us. Then, there are dreams that seem to allude us time and again. They beg to be caught hold of, but we just can’t figure out which steps are necessary to help reach them. Where are you in that tangled up kite tail? 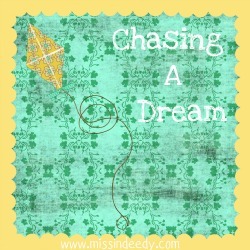 Let’s make this week the start of a dream-chasing journey together; I want to encourage you to chase after a dream. Maybe, that means acknowledging to just one other person that you actually have one. Or, maybe you know exactly what dream you harbor in your heart, you just need some encouragement to begin the chase. And possibly, like me, you are oh-so-aware of, and chasing hard after that dream, already. Remember the old Nike motto “Just Do It!”? It’s time. Whether that means it’s time for you to dig in to God’s word and seek out what He might have in store for you, or that it’s time for you to start getting some wise counsel for how to pursue your dream, or even that it’s finally time to take that first step off the ledge – trusting that God is going to show you exactly where to step next. Whatever it is for you, do it. Chasing a kite is always more fun with friends. If you’d like to learn more about The Kite Project, click here. Because, the more the merrier. Yes indeedy! This entry was posted in Blogging, Dreams, Yes, Indeedy and tagged Chasing Kite Tails, Dreams, God's will. Bookmark the permalink. Christina, you are so very welcome. Try and flesh out what those dreams might be with me! I have a dream-but often I am so afraid of failing. So, usually I just try to ignore it. Sad? Nope. Probably far more common than you think? You betcha! I pray you are able to feel a little boost of courage to chase after it – even if only with a tiny babystep or two! Thank you so much for your post Missy. I love it. I know when I think of dreams, often light things come to mind – like a new invention or a new business or maybe even an opportunity to volunteer. But I’m coming to realize that my real dream is to come to terms with really old childhood hurts – 3, 4, 5 and 6 year old hurts that stifle every aspect of my forty-two your old being. So that’s my dream this year. To believe with my whole heart and soul that even though bad things happened to me and even though I feel like a hurt child much of the time – that I can still be ok. And that I don’t have to build a wall up around myself. And when I finally let someone past that wall, realizing that if I feel a little hurt, I don’t have to kick that person right back over the wall…realizing that a little hurt is just that – a little present day hurt… not the old hurt happening all over again. If I can grab on to those kite tails, kicking off little by little the stuff that weighs me down (literally and figuratively! ), that will be my dream come true. I’m sorry if this was too much, but if it inspires someone to do the same it will be worth it. Count me in! Thank you for sharing your heart, my friend. Healing the hurt-child heart is a mighty business. One only God can do and I can’t even begin to grasp it. Realizing that a little hurt is just a present day hurt and not the old one resurfacing? That takes courage, insight, and, it seems to me, a healing heart. That’s more than a few steps in the right direction, friend! I heart you so, dear one. Thank you Monica! And oh my lanta- yes! Only He will determine if they are let loose to fly. Trying to continually keep that in mind, myself! I LOVE this. For real. I have a dream too and for a while I was wrapped tight in those kite tails, but I think the strings are loosening, slowly, but surely.